Are you intrigued to find out whether Sony alpha a6000 or Sony Alpha a7 is the better model? This is the same question that has caused a lot of people to have headaches, as those people are unable to decide which model that they should get. Of course, Sony Alpha a6000 and Sony Alpha a7 are both heavily and extremely popular mirrorless cameras on the market. In fact, we also have compared Sony Alpha a6000 to several other popular mirrorless camera models, such as Olympus OM-D E-M10 vs Sony a6000, and Sony Alpha a7 to its siblings. They are very well-known for their exceptional performance and output quality. Below, you can find the comparisons of the two. Hopefully, after reading the article, you will be able to determine which one suits your needs and requirements the best. 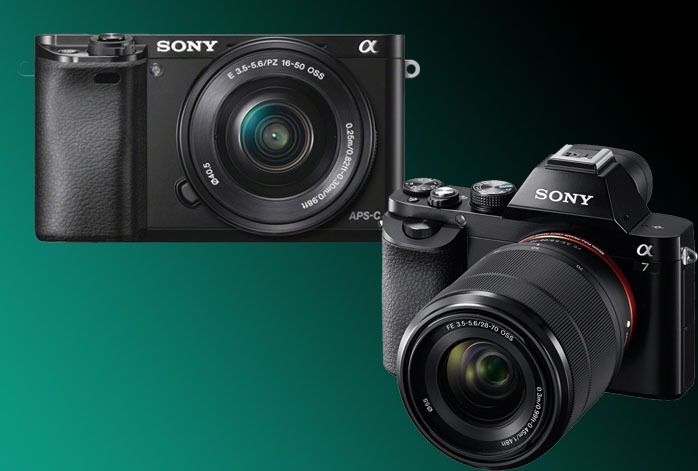 Quite interestingly, Sony Alpha a6000 and Sony Alpha a7 have nearly similar image sensors. Sony Alpha a6000 comes with a 24MP APS-C CMOS sensor. Sony Alpha a7 comes with a 24.3MP full-frame CMOS sensor. The maximum image resolution of Sony Alpha a6000 is pretty much identical to Sony Alpha a7’s. Yet, due to the larger sensor and bigger pixel area, Sony Alpha a7 can have better color depth and dynamic range than Sony Alpha a6000. Thus, its images can be more vibrant and vivid and accurate, especially when you try to emphasize and pronounce the colors. Sony Alpha a7 has a very good edge in video recording. It has a microphone port and even a headphone port, two things that Sony Alpha a6000 lacks. These features are hugely beneficial if you want to record videos with high-quality sounds. Anyhow, both models record videos in a maximum resolution of Full HD 1080p with a frame rate of 60 fps. Unfortunately, Sony Alpha a7 is not too good for taking pics of fast-moving objects. And this is where Sony Alpha a6000 shines. Indeed, Sony Alpha a7 has an exceptional maximum shutter speed of 1/8000s, which can be handy for other types of photography, yet it has low continuous shooting speed and relatively low ISO range. On the other hand, Sony Alpha a6000 boasts a maximum shutter speed of 1/4000s, which is adequate and certainly viable for many purposes, along with a whopping 11 fps burst in continuous shooting mode. Snapping pics of fast-moving objects can be done well by Sony Alpha a6000. Additionally, Sony Alpha a6000 has built-in flash, 51200 maximum ISO, and a neat number of focus points – 179. Considering that Sony Alpha a6000 is considerably more affordable than the other contender, Sony Alpha a6000 generally holds the best value for your money here. It is quite versatile for many photography purposes. It is also the only way to go if you photograph fast-paced actions and sports. Choose Sony Alpha a7 is you don’t mind to spare some extra bucks, and you don’t need a high fps burst, and you benefit from the mic and headphone ports!